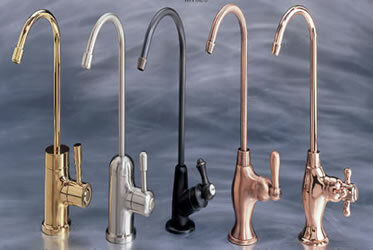 Mountain Plumbing Faucet Collection for Water filters. 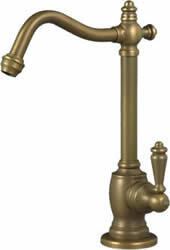 Mountain Plumbing Products, a McAlpine Company of Glasgow Scotland; is considered a leading manufacturer of high quality luxury plumbing manufacturing for over 100 years. Doulton, manufacturing world class ceramic water filter, industrial ceramics as well luxury porcelains for over 170 years. From left to right: Polished brass MT630, brushed nickel (stainless steel look) MT620, oil rubbed bronze MT625, weathered copper MT600 and antique copper MT610. 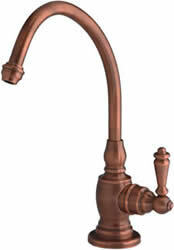 All Mountain Plumbing water faucets can be purchased only with Doulton water filter. 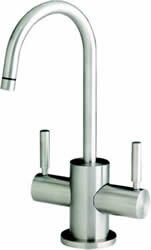 Brushed nickel and polished chrome single lever taps are shipped the same day, all other finishes in 7-10 business days. Click on faucet image to view details/purchase with filter. MT1103 - Victorian world charm, modern day technology. MT1150 - Old world charm, modern day technology. 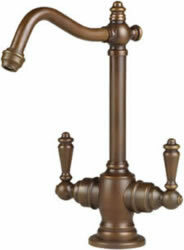 MT1203 - Graceful style, classic Edwardian form. Available in ten luxurious finishes. Available in eleven luxurious P.V.D. finishes. 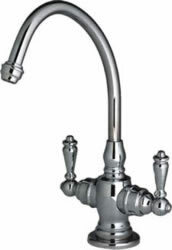 Doulton filtered Instant hot/cold/chilled water systems in five distinctive designs and numerous luxurious finishes. Technologically advanced construction combined with quality old-world craftsmanship gives each system heirloom status. Manufactured in United Kingdom with most advanced processes and valve technology for uncompromising performance and elegance. 7 gallons daily output priced at $699.00 USD. Quiet, compact and economical hides neatly under sink cabinet it uses only 135 watt electricity. With Doulton Imperial Ultracarbosyl water filter you'll do away with all those bottled water delivery.